One fine day in 1908, Luigi Pernier found, in an annex on the northeast periphery of the palace of Minos in Crete, in a wretched doorless shed of 140 square feet, entered through a trap door, amidst fragments of a tablet in Linear A, clay potsherds, ashes, charcoal residue, in short, amidst a bunch of trash, a circular terra cotta tablet, covered with limestone. When cleaned, it was seen to bear on its two sides some 240 hieroglyphs in an unknown script. And the writing's direction is even more remarkable than that of the Easter Island tablets: spiral! You will find a photographic reproduction on p. 44 of Writing: Man's Memory by Georges Jean in the Découverts Gallimard series. But to learn more you will have to unearth Vol. 12 of Glottometrika , published by the University of Bochum in Germany, in which Michael Trauth will explain to you very seriously and clearly all that is known about the mysterious tablet in an article entitled "The Phaistos Disk and the Devil's Advocate". 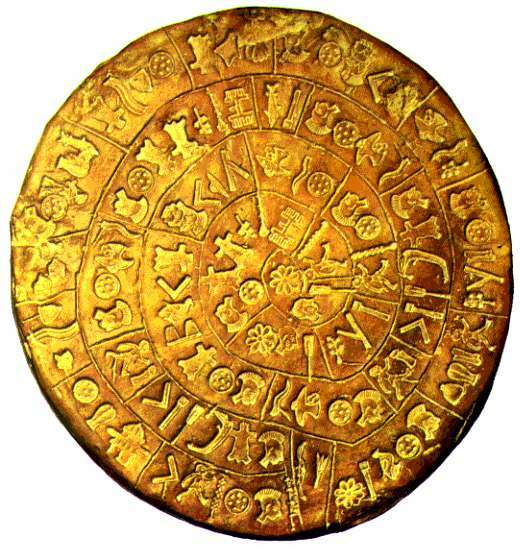 The Phaïstos Disk is in terra cotta, very fine, a little irregular. Its diameter varies from 6.2 in. /15.8 cm. to 6.5 in. /16.5 cm., its thickness from 16 to 21 mm. / 5/8 to 13/16 in. On each face a spiral line acts as a guide, like the lines in a school notebook, like the engraved grooves of the Easter Island tablets. It is generally agreed to date from the 17th century B.C., although some prefer to date it only to the 12th century B.C. ; still others back to the 19th century B.C. On one face are 122 hieroglyphs in 31 groups separated by a vertical stroke. On the other are 199 in 30 groups separated likewise. I've saved the best for the last: these hieroglyphs were, not carved, but stamped! Yes, 3000­4000 years ago printing was invented. On clay, certainly, and not paper, but printing nonetheless. What do these hieroglyphs resemble? All mixed up, one sees a bald head, another like a Mohican, a St. James shell (or a baseball mitt), a donkey's jaw (or a Venetian gondola), a round shield (or a revolver barrel), a square, a dove with an olive branch, a chrysanthemum ( or a daisy), a wine press (or a beehive), in all, forty­five different signs. Proposed translations range from a hymn to Poseidon to the story of Atlantis' disappearance. And why not? To experts in cryptology, it is a well­known fact that, given an enciphered text sufficiently short, one may propose practically any decipherment without being able to decide which one is correct. Now, not only is the text of the Phaïstos disk short, 241 hieroglyphs, but the language is unknown. Even the direction of the writing is undecided: from the center to the periphery, or the opposite. There is no way of knowing, because Shannon and Weaver proved, nearly 50 years ago, that the fundamental mathematical property of texts, entropy, is the same no matter which direction one reads them in. 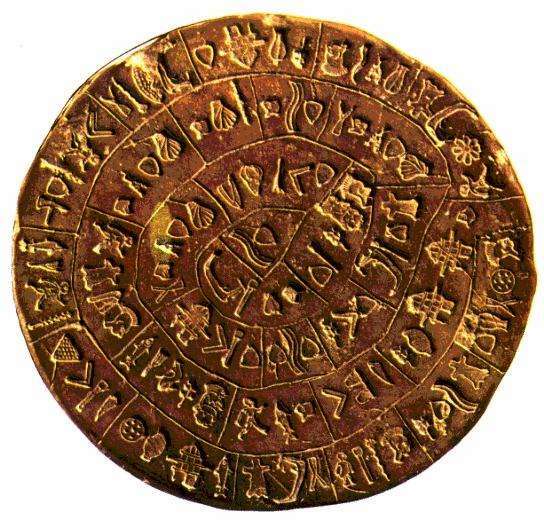 Well, unless someone discovers somewhere hundreds of tablets covered with the same writing, or a tablet with its translation in a known language, we will never be able to decipher the Phaïstos Disk. We don't even know where it came from. Found among the contents of the trashcans of the palace of Minos, one could imagine anything. No one knows what sort of writing it is, either. Alphabetic? Some say, "No, 45 signs is too much for an alphabetic script." Come on! That's just about the number of letters in the Sanskrit alphabet. And doesn't Arabic have as many as four forms for a letter depending on the position it occupies in a word? And we ourselves, don't we have upper­ and lower­case letters which scarcely resemble each other, and therefore not 26 but 52 letters? Others have said, "There are too few signs for an ideographic system like Chinese, so it is a syllabary." Nothing is less certain. The immense majority of ancient tablets, Babylonian, Sumerian, or others are only apothecaries' accounts, taxes received, disbursements, receipts. The Phaïstos Disk could very well be a bill of lading with so much of this, so much of that. Whether it were slaves, honeycombs, zebra skins, shields, or St. James' shells, a ship's cargo is unlikely to exceed a dozen different types of articles, and therefore, few different ideograms. Some have also said, "This cannot be an ideographic system, for there would have had to have been a different stamp for each ideogram." Ah, an excellent argument! Did the Chinese deprive themselves of the invention of printing under the pretext that their writing consisted of thousands of characters? No, truly, there is no way of knowing, it remains a complete mystery. Needless to say, that hasn't stopped some people from trying. As Voynichomanes, we both know that "to experts in cryptology, it is a well­known fact that, given an enciphered text sufficiently short, one may propose practically any decipherment without being able to decide which one is correct." Many otherwise intelligent people do not know this, and think themselves geniuses for discovering new interpretations of the Phaïstos Disk. The Phaistos Disk Decipherment Update is too good to miss. The latest breaking news: Paul Bahn, the noted archaeologist, describes the Phaistos Disk as a "large, carved stone disc" (New Scientist, No. 2121, p.44, 14 Feb. 1998). Large, carved, stone... all he got right was "disc". Probably a typo for "dish"!